In May this year, with CD sales slumping and the dash to downloads well under way, Universal Music Group (UMG) launched the first 36 titles in their ‘High Fidelity Pure Audio’ range. A mix of pop, jazz and classical, the idea was to offer previously released material on re-mastered CDs and high-res - 24/96 - Blu-ray Audio discs (BD-A). Among the first tranche of classical titles was Karajan’s Mahler Fifth and Carlos Kleiber’s Beethoven 5 and 7. 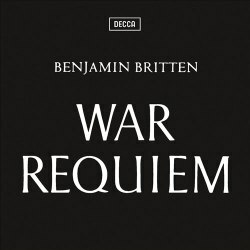 More a trickle than a flood, but since then we’ve seen a few interesting additions, among them the Decca War Requiem reviewed here. That said, all is not well with UMG’s release schedule; at the time of writing the release of new titles - including Mehta’s Vienna Mahler 2 - has been put back several months. UMG bailed out of Super Audio early in the game, although they did acknowledge the niche audiophile market by issuing a handful of high-res ‘Studio Master’ downloads via Linn’s website. I’ve reviewed several of these - Solti’s Mahler 8, Jochum’s Carmina Burana, Ansermet’s Debussy and Davis’s Symphonie fantastique - and despite the high price they are very desirable indeed. Now UMG are offering high-res versions of new material via the French download site Qobuz, often with pre-releases available for a pittance. The Dudamel Zarathustra and the Nelsons/Grimaud Brahms could be had for just a few euros each - including cover art and booklet. That’s all very well, you might say, but what if you don’t do downloads? In that case these re-mastered CDs and Pure BD-As might appeal. I say ‘might’ because although the CDs can be played in standard players/drives and ripped for use on mp3 or other portable devices BD-As need a Blu-ray player/drive or the latest PlayStation/Xbox. The latter aren’t likely to be part of a serious audio setup, but high-end Blu-Ray and universal players most certainly are. It must be these audiophiles who are the target market here, for otherwise I’d seriously doubt the wisdom of releasing Pure BD-As at all. What about newly recorded material? Naxos and some of the smaller labels - 2L and Sono Luminus among them - have taken the dual-inventory route and seem content to carry on doing so. My experience of these discs has been somewhat mixed; my first purchase, Corigliano’s Circus Maximus, refused to work in my player; the second, Wit’s Mahler 8, sounds terrific in PCM stereo, but as Dave Billinge noted the surround layer is somewhat problematic (review). Both are Naxos releases, and I now have a third, the Slatkin/Detroit Copland disc, in my review queue. Now for the War Requiem. It’s a work that’s fared well in this double anniversary - 100 years since Britten’s birth, fifty since the Decca recording was made - as John Quinn’s raft of recent reviews will confirm. Despite the number of competing versions Britten’s own remains sans pareil, its sombre black and white cover art as impressive now as it was back then. It was re-mastered and reissued - along with the rehearsal CD - as part of the Decca Originals series, and that’s the one I’ll use for comparisons. The fascinating rehearsal recordings were made by Decca’s producer John Culshaw for Britten’s 50th birthday; the surprise ‘gift’ was not graciously received by the composer, who felt it was an invasion of privacy. The Originals version of this recording is excellent, and it’s a testament to the skills of Culshaw and his team that it still sounds so spacious and involving. The antiphonal whispers of the Requiem aeternam have rarely been so atmospherically caught or its air of dark foreboding so keenly realised. The distant boys are magical too; goodness, hearing this performance again one is tempted to dismiss all others, such is Britten’s grasp of the unfolding drama. Fischer-Dieskau and Pears are superb in their solos - those summoning bugles are pretty thrilling too - and it’s all captured in sound of remarkable range and colour. This latest re-mastering will have to be very special to beat that. On the Originals the Dies irae cracks and booms with terrifying energy, and although the deep bass is somewhat unfocused there’s little sign of distortion. Vishnevskaya’s vaulting Liber scriptus is also crisp and clear, with no hint of edge or etiolation, even at these cruel extremes. True, the balances are closer than one hears in many rivals, but that simply adds to the blanketing horror and huddling, humanity of the piece. Switching to the new CD I was struck by the clean, clarified textures - the bells in the Requiem aeternam have great presence - but sadly there’s a trade-off; the spell-binding spatial effects of the earlier version are irretrievably lost. That’s a pity, for Culshaw’s painstakingly planned soundstage now seems much narrower and the recording is far less enveloping. Balances aren’t as close either, and for the reasons I suggested earlier that isn’t necessarily a good thing here. Most damning, though, is the messy Dies irae which, although forceful, is now rough and raucous too. As for the two male soloists the re-mastering has leached too much warmth and character from their voices. For all its virtues modern re-mastering often strips the originals of their grime and takes a layer or two of paint with it. Frankly I’m aghast at the distancing effect this has here, and I quickly returned to the Originals for relief and reassurance. Sampling other sections merely confirms my worst fears; and although The End is still deeply affecting - how could it be otherwise - all that ‘scrubbing’ has definitely reduced its musical and dramatic impact. In mitigation, I suppose the new re-master has a certain sophistication that may well appeal to modern ears, but that powerful sense of place, of a ground-breaking work being realised, has vanished. Pioneers in the early stereo age Decca didn’t always get it right, but when they did - here, in Solti’s Ring and Ansermet’s Geneva sessions - the results were spectacular. Sometimes modern re-masters do preserve that sense of wonder and discovery, while also offering real sonic gains; the high-res Universal/Linn Ansermet Debussy is a case in point. No sign of that here, I’m afraid; the choral climaxes - once full and warm, are now thin and fierce. Indeed, the relentless edge here and in Vishnevskaya’s taxing contributions is extremely fatiguing. Given that the recording's musical and interpretational virtues have been well documented over the years all I can really do here is focus on the sound of this new CD. The most dispiriting aspect of this tempting package - available online for around £18, sometimes slightly less - is that slick marketing and keen pricing could fool buyers into thinking it’s somehow definitive. In the case of this re-mastered CD that’s demonstrably not so. Anyone who wants this recording in that format should invest in the Originals set, which now retails for under a tenner. This is one of the greatest works - and recordings - of the modern age, and it’s a mandatory addition to any collection. The rehearsals contained on the second CD are very enlightening indeed. Britten is meticulous in his requirements, and warm in his praise; I like his dry sense of humour too, although there are more than a few glimpses of his steely determination as well. It’s not something one would listen to very often, but we should be grateful to Culshaw for allowing us to eavesdrop in this way. Now for the pièce de résistance, the ‘High Fidelity Pure Audio’ Blu-ray. This is what UMG’s high-res strategy is all about, so it’s vital that it works. And does it? Yes, it most certainly does. The simple display has a menu with numbered cues, track-listing and a ‘How to’ sub-menu; thankfully there’s no distracting visuals or background audio. Seconds into the Requiem aeternam and it’s clear the engineers have achieved something quite remarkable; words are so much clearer and orchestral timbres emerge with startling clarity and impact. Indeed, I can hear details that I’d never heard before, all of which left me reeling once more at the genius that is Britten. Culshaw’s perspectives are not as pronounced as they are in the Originals set, but at least they haven’t been flattened as they are on the new CD. Balances are close too, and that makes for a truly cataclysmic Dies irae. The stuttering brass are particularly impressive, and while the low bass isn’t well defined there’s no sign of impending break-up either. As for Pears and Fischer-Dieskau they return in triumph, their full, distinctive timbres intact. Even Vishnevskaya - in the Liber scriptus and later in the Lacrimosa and Sanctus - is restored to her former glory. Owen’s Futility and Strange Meeting are as indescribably moving as always, and Britten’s spare orchestral touches sound more delicate, more tactile, than ever before. Just to make sure I hadn’t lost my critical marbles I returned to the Originals set and was gripped all over again. The BD-A is certainly astonishing, but there is one issue worth mentioning; in Strange Meeting the left channel seems rather dead, whereas in the Originals it’s also quiet, but it does have enough presence to avoid this strange ‘black hole’ effect. I found this disconcerting, not so say distracting, but I suppose it’s a small blemish on what is otherwise a fine re-mastering. Choices, choices. If you only want this War Requiem on CD look no further than the Originals. Trouble is, if you want the BD-A you will have to pay twice as much for the three-disc box; that’s a real nuisance, especially as the sonics of the accompanying CD are so regressive. However, there is one other option; the Linn/Universal 24/96 Studio Master. I requested a review code for this but my contact at Linn informed me that UMG had instructed them not to allow this any more. A bad decision, I fear, but contemplating a purchase made me realise just how absurdly expensive these high-res downloads are; that said, your £18 now buys you a booklet as well, which was not the case when these downloads first appeared. I will keep the Originals for their analogue warmth and remarkable sense of presence; I’m also impressed with the Blu-ray, which offers extra clarity and detail without losing too much of the atmosphere that makes Culshaw’s landmark recording so very special. In any event this new box demonstrates that UMG’s multi-pronged marketing strategy might just be a good thing; I certainly want to hear more of these BD-As, so let’s hope their release schedule is fixed some time soon. The re-mastered CD is a retrograde step; the Blu-ray, though, is a revelation.